LibraryEndowment.org is an overview site for the busy—read our vision in 100 words. But you can also drill down for details here and elsewhere. See articles in the Washington Post, the Christian Science Monitor, Education Week, Library Journal, and the Chronicle of Philanthropy (image). LibraryCity is the small grassroots group that created LibraryEndowment.org. From the start, our vision has been broader than simply bigger and better libraries in digital format. We care endlessly about physical libraries as well and have spent a lot of time talking up the benefits of any kind of reading. Also, we are not the Digital Public Library of America, a different organization with different priorities. To avoid confusion, we’ve dropped “Digital” from the proposed name for the endowment even though the new technology is still a core part of our vision, given its usefulness for bringing vast collections even to small libraries. Warren Buffett has said just one book changed his life when he was young. That possibility is the glory of books of any kind. A K-12 librarian on the urgent need for a national library endowment. Paula L. Wyatt works at a cash-strapped elementary school. Corilee Christou is our new library and publisher relations director emeritus. To spend more time with her grandchildren, Corilee is stepping down as director, but she continues to believe in the cause. We are looking for a replacement for her as library and publisher relations director. Contact Co-founder David Rothman at drothman@libraryendowment.org or 703-370-6540. How the Hernandez family will benefit from a national library endowment and two well-stocked digital library systems. All kinds of services, not just digital ones, help the Hernandezes. This article originally appeared on the LibraryCity site in a slightly different form and was summarized in an Information Today commentary in the January-February 2017 issue (clip here). Why We Need a National Digital Library Endowment, in Education Week. School libraries are dear to us, and we want much more available money for the education, hiring, and professional development of K-12 librarians. The K-12 and economic cases for a national digital library endowment, one version of the evolving endowment-proposal. As in the Hernandez case, we discuss general benefits of reading and libraries rather than confining ourselves to digital matters. 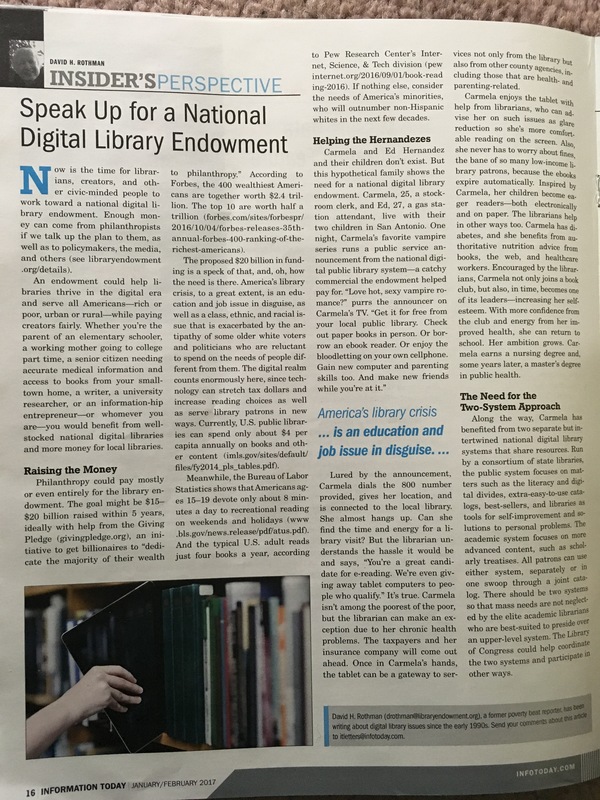 Endow a National Digital Library, in Library Journal. The Rich Could Tackle Many Social Ills by Supporting a National Digital-Library Endowment, in The Chronicle of Philanthropy. On Robert Frost, Fences, and Electrons: Why we need two separate digital library systems for academics and the rest of America—and content exchanges and other neighborliness. How much money for what? Just a starting point for discussion. More money for outreach could encourage the reading of paper as well as digital books. Also, more money could help cash-strapped libraries extend their hours. Ebook myths vs. true scientific curiosity and ebook literacy. No, ebooks aren’t a passing fad. But we could do much better. Librarians and educators need to understand that traditional literacy isn’t enough to get the most out of ebooks. K-12 students and others also need full-strength ebook literacy so that, for example, they can reduce eyestrain and also enjoy optimal typography. The endowment will help pay for professional development to enlighten librarians, educators, and others about ebooks. Want more race riots and antisemitism? Underfund libraries. Watch this shocking video. E-books, e-reading help child literacy: Major study from UK Literacy Trust. Book review: Bexar BiblioTech: The Evolution of the Country’s First All-digital Public Library. Cell phone book clubs: A new way for libraries to promote literacy, technology, family and community. Books and billionaires, in the Baltimore Sun. Jim Duncan, Colorado Library Consortium executive director, speaks out in LibraryCity series on public libraries and the Digital Public Library of America. Infrastructure Watch: Warren Buffett as the Next Carnegie, at TheAtlantic.com. Digital libraries are the future: Nation needs a common framework for lending e-books to the public, in the Baltimore Sun. Note: LibraryCity supports the right of local libraries to acquire paper books, ebooks and other items not within the national system. But a national approach could significantly lower costs. Toward a Library-Publisher Complex for the digital era: Where the money is for both sides. Good libraries can enlarge, not shrink, the market for content of all kinds. Today the average American household spends only about $100 a year on books and other recreational reading, compared to several thousand on other forms of entertainment. How to make Rockford an e-book leader, a commentary following up on an op-ed in the Rockford (Illinois) Register Star. A Point-Counterpoint on the Digital Public Library of America, on the Library Journal Web site. It’s time for a National Digital Library System. But it can’t serve only elites, in The Chronicle of Higher Education. How e-Books Could Smarten Up Kids and Stretch Library Dollars: A National Plan, in The Huffington Post. Why We Can’t Afford Not to Create a Well-Stocked National Digital Library System, in TheAtlantic.com. A national information stimulus plan: How iPad-style tablets could help educate millions and trim bureaucracy–not just be techno toys for the D.C. elite, in TheAtlantic.com. Real Books on the Internet, in the Washington Post. A national digital reference service for the U.S. The Changing Face of Literacy, from Education Week. An excellent series on the whole, although it falls to do justice to all the nuances of ebook literacy. See Ebook myths vs. true scientific curiosity and ebook literacy here on libraryendowment.org. Fighting Fake News: How libraries can lead the way on media literacy, by Marcus Banks, American Libraries, December 27, 2016. Funding Indian public libraries, a proposal from a kindred spirit, P. Jayarajan, now chair of the advisory committee of the Indian Public Library Movement. See our related article, Why India’s billionaires should support a national library endowment, in Views on News, an Indian news site. EveryLibrary.org, a much-needed organization fighting for support of public and other kinds of libraries. Local support is an important part of American library culture and is entirely in line with LibraryCity’s philosophy. The proposed endowment among other things would match local donations and other local sources of revenue (while making allowances for cash-strapped districts). Photo credit: The shot of the young Poe-reader is Creative Commons-licensed and is from the Unquiet Library (not associated with this site).